Our winter active campaign helps Nova Scotians of all ages improve their health and quality of life by being active during the winter months! Take the Roof Off Winter 2019 is over until 2020! NS Trails Takes The Roof Off Winter from NS Trails on Vimeo. 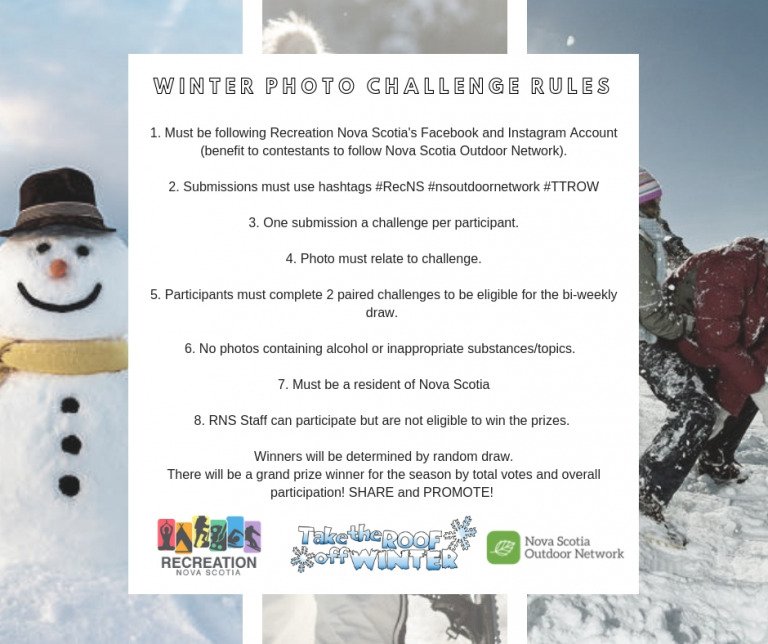 We had a TTROW Photo Challenge where participants could win prizes! 1st: January 7th-13th : Winter Selfie! FIRST WINNER ANNOUNCED : Friday, January 18th. The winner was Madonna Prosper from We'koqma'q, Cape Breton! 3rd: January 21st-27th: Winter Warm Get-Up! SECOND WINNER ANNOUNCED: Friday, February 1st. The winner was Tiffany Rudolph from Enfield! THIRD WINNER ANNOUNCED: Friday, February 15th. The winner was Karri Towell from New Glasgow! FOURTH WINNER ANNOUNCED: Friday, March 1st The winner was Zach Lushington from Lantz! 9th: March 4th-10th: What does winter look like to you? FIFTH WINNER ANNOUNCED: Friday, March 15th: The winner was Wayne MacKay from Cape Breton. GRAND PRIZE WINNER WAS: Les Shepard from Afton Station, NS! We hosted our very own TTROW Fair along with collaberations of events around the province. We posted weekly Winter Tidbits about winter safety and fun facts! Interested in donation prizes or collaberationg with RNS for the next Take the Roof Off Winter? E-mail: !